The blog’s name is: “Rudraksha Yoga“! “Looks like another Yoga prescribing some new type of pose (asana) like dinosaur pose!” and so on. Hmm..banish those thoughts! It does not mean anything like that for Heaven’s sake! Further, please understand that this blog does not sell any Rudraksha beads or some fashionable New Age Yoga. OK. Come along! Let us explore some real meanings of the word Rudraksha Yoga. Rudra means Lord Shiva, Aksha* means Shri Shakti(Shridevi Parvati). Lord Shiva and Shridevi are two inseparable aspects of the Universal Self(a.k.a Ultimate Reality). Yoga means merging or union. Who has to merge with the Ultimate Reality? Our own real us within us, i.e. Individual Self. Why? To come out of infinite birth and death cycle that we are in. So, Rudraksha Yoga means merging of our Individual Selves with the Shiva and Shakti who are nothing but the Ultimate Reality. .Rudraksha Yoga also means the ultimate purpose of human life, i.e. merging our Individual Self with Ultimate reality. Rudraksha means Shiva and his Shakti, who are always united together as the Universal Self. Yoga means union. Different paths of traditional yoga help us recognize that we are Individual Self. Our Individual Self is nothing but Universal Self(a.k.a God) itself. In other words, we are nothing but God! This realization of God within ourselves is the Highest Knowledge. So, the name of the blog, Rudraksha Yoga represents what it deals with. It explains the nature of Lord Shiva and Shridevi Shakti. It elaborates core principles of different forms of traditional Indian yoga. It also describes the Highest Knowledge that has been articulated by our Great Masters in our Divine Scriptures. It also means inseparable nature of Shiva and his consort Parvati(Shakti). Rudra means Shiva, Aksha means Shakti. Yoga means union, becoming one or being one. It implies that Shiva and Shakti are One suggesting that Ultimate Reality is only One i.e. indicating non-dual philosophy, viz. Individual Self is same as Universal Self. So, Ultimate Reality is only One. The non-dual advaita philosophy was established by our Great Master Shri Shankaracharya Bhagavatpadah. Here is yet another mystical meaning: Mantra Yoga! Rudra means Lord Shiva and Aksha means Sanskrit alphabet A to Ksha. Lord Shiva revealed the letters of Sanskrit alphabet by the sound of his Damaru during his divine dance. So, Rudraksha means Sanskrit alphabet revealed by Shiva, i.e. Lord Shiva’s alphabet! Because of this divine connection, the Sanskrit alphabet provides us the most powerful phrases or Mantras for yoga. So, Rudraksha Yoga is the yoga by Sanskrit letters/mantras is just another path: Mantra Yoga! It further means, Kundalini Yoga. Let us see how: Rudra + Aksha Yoga. Yoga brought about by spiritual power Shri Kundalini Shakti(Aksha) to merge with the Ultimate Reality(Rudra/Shiva). It represents a mystical path of Siddha Yoga which is initiated and guided by Guru’s Grace. God-realized Master is same as Lord Shiva. In other words, there is no difference between Lord Shiva and Realized Perfect Master(Sadguru or Siddha Guru). The word Rudraksha also means compassionate(graceful) tears of Shiva as Rudra=Lord Shiva, Aksha = tear drop. So, Lord Shiva’s Graceful tears metaphor with Guru’s kind Grace. Thus, Yoga initiated by Guru’s Grace is Rudraksha Yoga which is nothing but Siddha Yoga(a form of Kundalini Yoga). It means Gauri Shankara Rudraksha. How? 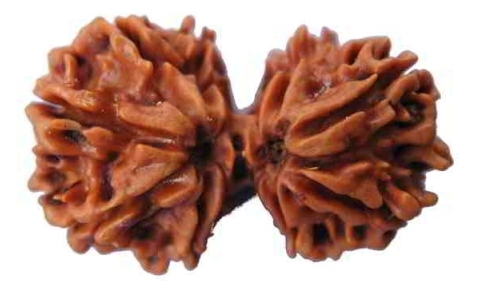 Rudraksha are divine beads from a tree Elaeocarpus Ganitrus Roxb that grows mainly in India, Nepal and Indonesia. Naturally conjoined bead formed by two Rudraksha beads is called Gauri Shankara Rudraksha. Rudraksha Yoga means union of two Rudraksha beads, which is Gauri Shankara Rudraksha(please see the picture above). It implies Lord Ardhanareeshwara. This deity is with right half Lord Shiva and Left half Parvati Devi. It represents ultimate oneness of Shiva and Shakti.. In summary, as different meanings indicate: this blog deals with the topics on Sanatana Dharma(a.k.a Hinduism) with a clear focus on Shiva-Shakti Principle, Highest Knowledge and different traditional real yoga paths as mentioned in our Scriptures and passed on to us by our Great Spiritual Masters to benefit one and all. Notes: *According to Scripture Tantras, Aksha means Shridevi, who is the inherent power present in all letters of Sanskrit alphabet starting from letter A and ending with Ksha. So, Shridevi is also called Vak/Saraswati meaning power in the speech, letters, words. Next topic: Bhakti Yoga: Path of Devotion. Stay tuned! May everybody be happy !! This entry was posted in About this Blog, Oneness of Shiva and Shakti and tagged aksha, bhakti yoga, guru, hinduism, knowledge, kundalini yoga, oneness of shiva and shakti, parvati, philosophy, religion, rudra, rudraksha, Rudraksha meaning, sanskrit, sanskrit alphabet, shakti, shankracharya, shiva, siddha yoga, spirituality, ultimate reality, yoga. Bookmark the permalink.